Most consumers still using the three-month free trial of Apple Music say they are likely to continue paying for a subscription after the period ends, new survey data shows, though a significant portion may have dropped off soon after trying the service. Of the iOS users who told market research firm MusicWatch that they were listening to Apple Music, 64 percent classed themselves as extremely or very likely to continue with a paid subscription. Many have already turned off automatic renewal in iTunes, however, suggesting that there is still a great deal of uncertainty surrounding the nascent service. MusicWatch says that they came by the data by interviewing 5,000 U.S. consumers, though it's not clear how many of those were iOS users. 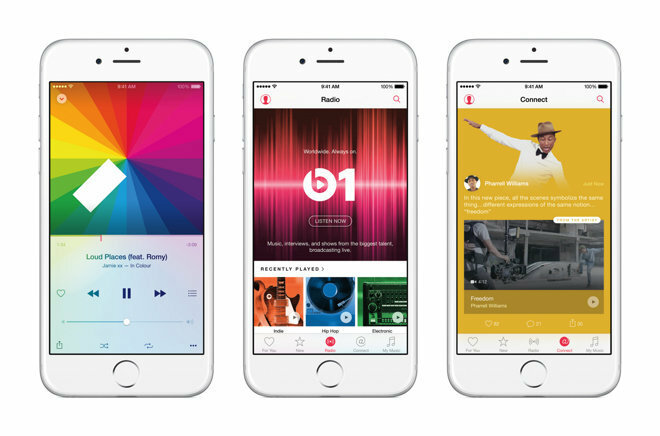 Additionally, the firm found that 48 percent of those who tried Apple Music at one point had stopped using it. MusicWatch didn't say how those figures cross with the number of consumers that also use Spotify or Pandora— 39 percent of surveyed Spotify users and 6 percent of Pandora users had tried Apple Music— though they did note that Apple Music had won "very few" users of other services over permanently. There is room to grow for Apple, as just 77 percent of the iOS users surveyed said they were aware of Apple Music's existence. Of those that did know, 11 percent had tried Apple Music— compared to 40 percent who download tracks from iTunes. "In terms of benchmarking Apple Music, 40 percent of iOS users are buying digital downloads from iTunes, suggesting trial of Apple Music could be higher," MusicWatch managing partner Russ Crupnick said in a release. "That's the disadvantage of not being the first mover in a market where very good services currently exist." Update: Apple refuted the numbers in a statement to The Verge, saying 79 percent of those signed up for Apple Music are still using it.